***NBC Universal's still struggling broadcast arm -- NBC -- could use a little prime-time oxygen. In the meantime, the corporation has expanded its cable holdings by acquiring Oxygen for a tidy $925 mil. Launched in February 2000 as an arch competitor of Lifetime, the "female-targeted" network is now available in 74 million homes. Some of them even watch it. 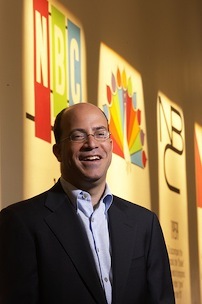 NBC Universal CEO Jeff Zucker says in a statement that Oxygen has "become the crown jewel of independent networks. It's a terrific property with a clear mission, strong brand and desirable audience." Even better, says Zucker, the acquisition "increases our foothold in the advertiser-coveted young, upscale, female demographic." Oxygen CEO Geraldine Laybourne, who co-founded the network with Oprah Winfrey among others, says the new deal is "the best way for Oxygen to grow. In seven years, we built a spectacular brand for women." The network isn't exactly an arsenal of hits. But it's allegedly "rewriting the rule book for women's television" with series such as Tori & Dean: Inn Love, The Janice Dickinson Modeling Agency and The Bad Girls Club. NBC Universal's other cable holdings are USA, Bravo, Sci Fi Channel, CNBC and MSNBC. ***Here's some other exciting NBC Universal news. It's tabbed burned out wrestler Hulk Hogan to host its new version of American Gladiators, slated to premiere sometime later this season on the NBC broadcast network.